Critical round up: what does the world think of Battlefield 1? We've got a few more days until Battlefield 1 takes us to the trenches of WW1 (unless you pre-ordered a special edition to get early access), but reviews have already been given their marching orders and are out in the field. Our very own Battlefield 1 review is out fighting the good fight of course, but if you're curious what others think, why not take a quick look below? However accurate or inaccurate Battlefield 1 is - lite J.J. Abrams lens effects notwithstanding - the immersive production values superbly amplify the sights and sounds that have previously existed in other war shooters. Examples include the distinct clatter of empty shells dropping on the metal floor of a tank and the delayed sound of an exploding balloon from far away. The brushed metal on a specific part of a revolver is the kind of eye-catching distraction that can get you killed. Beyond the usual cacophony of a 64-player match, salvos from tanks and artillery guns add bombast and bass to the large map match. And many vistas are accentuated with weather-affected lighting with dramatic results, like the blinding white sunlight that reflects off a lake after a rainstorm. Battlefield 1 successfully threads a very delicate needle in its handling of a war that lacks even World War II’s "easy" dichotomy. Battlefield 1 brilliantly avoids the war shooter conceit of One Man’s Long Campaign. Hell, it avoids the single protagonist/storyline problem altogether, sidestepping the narrative difficulties of trying to stretch a story across six to eight hours. 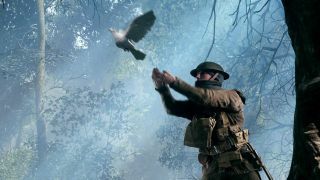 Instead, DICE has created a WWI anthology, telling largely unconnected stories about various men (and women) throughout the theaters of the Great War. These stories are generally well written and tonally varied. Some characters are desperately trying to survive, some are looking for redemption, and some are mounting a guerrilla resistance to centuries of occupation. There’s some quippy heroics at one or two points, which is nice, honestly, because Battlefield 1 is, more often than not, pretty dark. Any heroism on display is contextualized within a conflict that had little in the way of triumph. The curve is sort of all over the place, even more so because you can play these missions in any order. In sequences like the armored Italian, it’s almost impossible to die, but occasionally the game gives you a really irritating task, like protecting a fleet of bombers as the pilot, and the mission can take a full half hour by itself as you simply cannot shoot down enemy planes fast enough. Similarly, there’s a boss fight in the desert against an armored train where the game suggests you use mounted anti-armor cannons to chip about 5% of its health at a time, all the while dodging one-hit-kill mortar blasts. It wasn’t until I realized I could just walk up to the thing and wallpaper it with dynamite that I realized this wasn’t this maddeningly frustrating exercise I believed it to be. In general, dying is an irritating experience because the game will set youso far back. You can creep through a fort and kill 24 of 25 enemies in a 20 minute firefight, but if that last one gets you, you’ll have to re-do the entire sequence. Here Battlefield 1‘s less precise weaponry and slower-moving vehicles work to the game’s advantage, modulating the havoc of platoon-scale fracas by increasing reaction times and slowing things down in general. It won’t protect neophytes from practiced adepts who’ve mastered every weapon’s quirks and committed all of a map’s exploit points to memory. But it does scale back the sense that you’re playing a game in which the outcomes feel pathologically precision-driven. Battlefield 1 does feel appropriately old fashioned, although more in the context of the Battlefield franchise itself than actual history. With none of the complex command structure or technology of Battlefield 4, this new game is much closer to the original Battlefield 1942 in terms of gameplay and options. When playing in 64-player battles you can join a smaller squad of team-mates, which gives you the option of spawning next to an ally when you die, but beyond that it’s just you and your old timey gun against the world.